This page created 15th August 2001, updated 6th September 2002. DMS132 in preservation in October 1997, at Stoke d'Abernon Station for a Cobham RF Running Day, alongside RP90. Photo by Ian Smith. DMS1, the doyen of the fleet, is preserved in the London Transport Museum at Acton Depot. En route to its new home in December 1999 it is seen at Covent Garden Piazza, outside the Museum. Photos by Ian Smith. 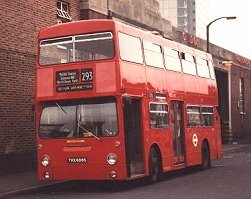 So London Transport ordered an updated version of the Fleetline, with a modern, angular, Park Royal body on it: the DMS, to complement its single-decker Merlin MBS and Swift SMS fleets. Like them it would also come in a crew-operated form, the DM. LT thought it had probably got it right. It had previously been attacked politically for its choice of the expensive, sophisticated, engineeringly innovative Routemaster, and was now buying a standard home-grown product after trials lasting five years. The bus was essentially an updated XF, albeit with two doors, automatic fare collection machines, and various microswitches to ensure that the bus couldn't go anywhere if the doors, flaps and various covers were not shut properly. What could go wrong? Well, the basic problem was that it was not an RT, RF or RM. These machines, sophisticated and technically advanced when introduced, had settled down to utterly reliable service. If things went wrong, they could be fixed in the down-time before the next shift, or exchanged. Taking an engine or drive-line out of one of these was quick and simple. So London Transport had become used to employ a tiny staff of fitters and engineers at garages. When the DMS arrived they met a very different machine, with a national-average rate of failure. The garage technical staff were overwhelmed by the volume of work generated and the time taken to fix it. You couldn't swap a Fleetline engine overnight. Several vicious cycles developed, with technical staff under pressure: more work, more difficulty recruiting, fewer staff, more work; more time pressure, skimped maintenance, more failures, more time pressure. Out on the road too there were problems. Originally planners and accountants saw the DMS as an 89-person box, replacing 61 (RT), 69 (RM) or 77 (RML)-person boxes. So they replaced the open-platform buses with fewer DMSs to maintain capacity. They had forgotten that route speed is also a factor in route capacity, and that with slower buses the route capacity drops. And the DMSs were SLOW. Not between stops, particularly, although the extra two tonnes of bus plus the extra tonne or so of extra passengers meant that they were not sprightly. It was AT stops that things went aglay. 89 passengers times 3 seconds per passenger comes to over four minutes. Even at intermediate stops the loading times were much longer than with an open-platform crewed bus. The AFC machines were temperamental. Machines carrying delicate lever mechanisms for identifying coins are not meant to work on a violently accelerating platform! But passengers understandably did not want to risk losing their money on the bus fruit machine. If they did they found hefty barriers preventing their reaching the driver. Not surprisingly the machines were under-patronised, and the drivers over-worked. This all altered not just the public perception of the buses, but their economics. Very soon route conversions had to replace RMs/RTs with equal numbers of DMSs. Even that was not enough, and later conversions used MORE DMSs. Furthermore, on roads where DMS shared with platformed buses, the public soon became used to waiting for the latter if they could see one coming in the distance, knowing that it was very likely to overtake the lumbering giant. In other ways the buses were unreliable too. The extra weight meant that brake linings wore out very much faster, and transmission failures were more frequent. Gearboxes, designed for gear changes with the foot OFF the throttle, did not take kindly to the London way of bus-driving with full-throttle changes. Microswitches for detecting the closure of doors failed - or the doors failed to close properly as the buses flexed under load - so buses couldn't be put into gear. There were, not surprisingly, stress problems around the great big hole in the middle of the side of the bus (the exit doorway). But London Transport had no choice really. The RTs WERE getting old, and the DMS still had two crew members to support. And there was nothing else that was any better. So LT bought 2646 of them. They were not complacent about the problems, either. There were experiments to educate the public about using the afc machines (mainly ignored). 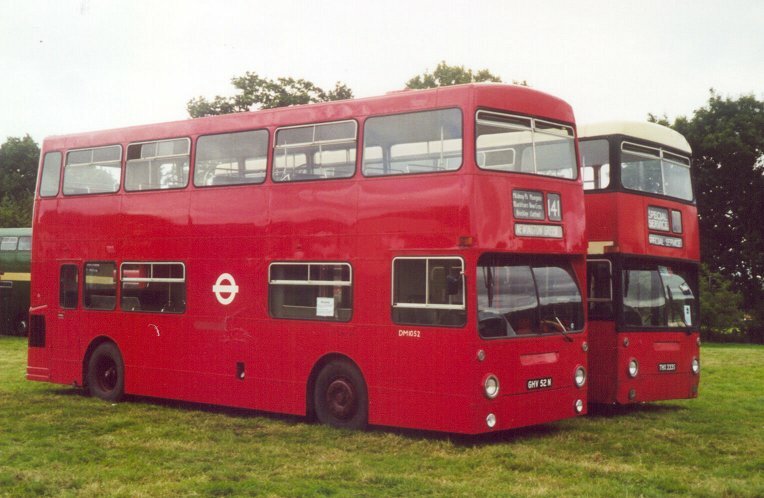 Buses for trunk routes were built without the afc equipment and with extra standing space (DM class), for conductor operation, although a satisfactory strategy for conductor operation was also hard to come by with this size and layout of bus. Later still it was realised that the fare equipment could be removed from the DMS buses for driver-only operation too, creating the D sub-class. In a bid to provide a quieter, nicer bus to travel in, Leyland and LT produced a version powered by a turbo-charged engine in a quietened engine compartment: the B20. These were slightly longer, with cowls above the engine compartment for air exchange. They didn't cure the underlying problems of the DMS. Worse was to come. When DMS1 went to Aldenham for a pilot overhaul in 1976 it was found that removing the body distorted it. 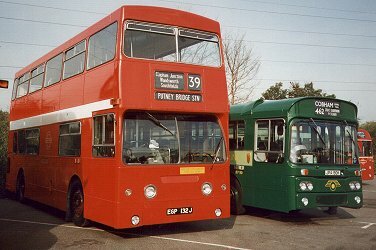 The Park Royal-built buses could not be removed from their chassis for overhaul. The Metro-Cammell Weymann bodies were removable (it had been specified in their contract), but as Aldenham had to get used to whole-body overhauls (which again adversely affected the economics), the MCW buses were also never separated. Overhauls were started, but began to prove too costly to do to Aldenham standards. "New" buses from overhauls were not on. So the idea of twenty-plus year lives for the DMS class withered too. So London Transport looked for alternatives. The Leyland Titan, developed by LT and Leyland, addressed many of the DMS problems, as did MCW's development, the Metrobus. These started to arrive alongside the last of the Fleetlines in 1978. 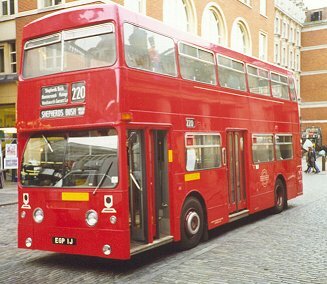 Withdrawals began in 1979, and gathered pace with the arrival of newer buses and the service reductions following Bromley's court action against "Fares Fair". By 1983 most of the non-B20s had gone, except for those on training duties and contract work. But they too had a short renaissance with the arrival of tendering and low-cost units. In 1987 London Buses won a contract for the Kingston network on the basis of a low-cost unit based on Norbiton garage. Non-B20s were scraped up from around the fleet and drafted in. Likewise Sutton garage was established as Suttonbus in 1988, using the remaining B20s as a basic workhorse. Bexleybus had 17 reinstated DMSs, plus 14 bought back from Western SMT. But they - and Bexleybus - did not last long. The public were not prepared to put up with any old rubbish just because it was cheap. Neither were the crews. Low cost units went to the wall, or learned the lessons that quality matters. By 1993 it was all over. The DMS had gone from LT service. Many were surprised that it had lasted so long, covering a span of 23 years, with the B20s giving up to 15 years LT service without benefit of Aldenham renewals. Not that the DMSs had all disappeared, even from London. 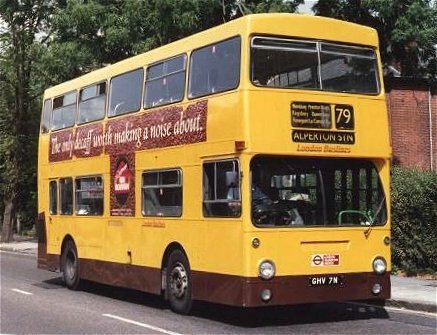 Ensign Bus of Purfleet had contracted to take London's redundant Fleetlines and made a huge business out of sales and rebuilds. 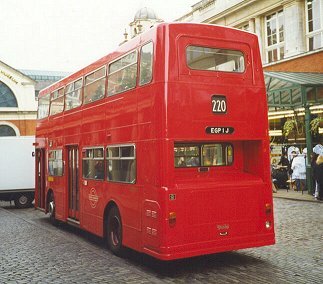 They learned how to strip out the annoying features that had plagued LT's engineers, to produce reliable buses that other operators were delighted with. It was not just small operators that took them either: West Midlands PTE, Midland Red, Hants & Dorset, Western National, Western SMT were all significant users. Over four hundred went to Hong Kong and China, where they operated under loads and city conditions that made London operation look like childs play. In London too the DMS found a role with emerging companies such as Metrobus of Orpington and London Buslines. 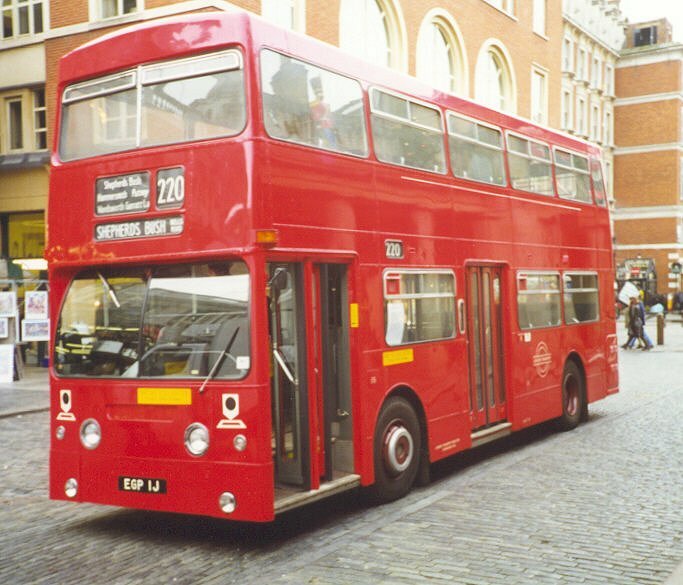 A major role was found as a London tour bus with a number of different operators, in which guise the DMS was seen in daily service in London until the turn of the Millenium. So the DMS was NOT altogether a bad bus. But it was following a couple of class acts in the RT and RM. It wasn't the bus that LT wanted. It hadn't been designed with LT's drivers, mechanics and passengers in mind. 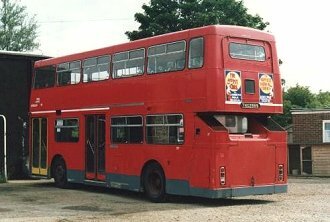 In dealing with the DMS LT learned the lessons it would need for the second-generation of rear-engined opo double-deckers. It paved the way for the Titan and the Metrobus. Paul Watson wrote the definitive DMS pages from which these pages are derived. He asked me if I would like to re-write them in my style. To him I owe much of the information about the history of the class as a whole, as well as permission to re-use his photographs. Richard Cains, on the other hand, has provided nearly all the data that is in the individual bus histories. Bus Stop Part 1. Part 2: Construction. bus histories. photo refs.